ICD-10: Know ICD-9 And ICD-10 Differences Beforehand! - Outsource Management Group, LLC. Medical Billing » Blog » ICD-10: Know ICD-9 And ICD-10 Differences Beforehand! 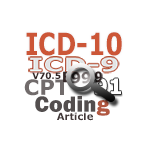 ICD-10: Know ICD-9 And ICD-10 Differences Beforehand! ICD-10 deadline is looming. The fear of October 2014 has sent the healthcare industry in a tizzy with many fearing for its accurate compliance. The haphazard preparation of the diagnostic codes is a disaster waiting to happen. Before chalking out the ICD-10 action plan for your practice and to ensure a smooth transition from ICD-9 to ICD-10, it would be wise for you to know the most crucial differences between ICD-9 and ICD-10. ICD-9 has been marred by a glaring lack of specification, for instance, the same injuries on opposite limbs comprise the same code. This leads to complexity and gives room for confusion on different levels. Whereas, ICD-10 includes a great extent of specifics in various areas – right versus left, initial or subsequent encounter as well as relevant clinical knowledge. ICD-9 codes come with 3-5 digits that can start with a number or even a letter, the third digit will have a decimal attached to it. The ICD-9 book highlights the information-packed topics for the codes. But ICD-10 codes include seven digits. With an aim to make the coding process more refine, ICD-10 will include approximately 68,000 codes, while ICD-9 includes only 13,000 codes with a very stunted concept of addition. Also, the codes will have a new streak of change, so I advise you to adopt an effective approach of code-searching in the new system. ICD-10 will use codes that are much longer in length than its previous counterpart. Digit 1 will remain in alphabets, whereas, digits 2-3 will be alphanumeric. The change of digits is apparent with digits 4-6 pertaining to clinical information likes severity, etiology, and anatomic site. They can be associated with alphabets or numerals. Also, digit 7 is deemed for extension and can be tagged under alphabets or even numerals. ICD-9 has been applying both V and E codes. Coders resort to the usage of V codes for supplementary classification of factors that have an impact on the health status and also influence the connect with health services. E codes have been used for detailing the accidents or events that are responsible for the patient injury. However, ICD-10 is inclusive of codes that are covered under the V and E codes, but here is the catch and the difference – they do not begin with those specific letters. The latest version of ICD has been in existence since 1998, but the United States of America will be the last nation to introduce and incorporate the ICD-10 changes this year, which is a 10 year delay. Resistance to ICD-10 is because of the costs associated with it, which comes at a time when the U.S. is trying to manage the skyrocketing costs of the healthcare industry. The documentation work is in sync with ICD-10. This does not require a lot of work; just ensure that lab reports, test results and other clinical documents support the ICD-10 diagnostic codes. To get ahead of the challenge, why not devise a testing plan? This way, you will be able to create scenarios with goals and data that might happen in future, it will be like your reality check to the upcoming transition. Quality exists in your plan, which has to be a compilation of various internal testing procedures, transaction testing, along with a well-defined schedule. Click Here to visit the AudioEducator website for more information.